How can I display the free loads only within a certain range? Unlike structural elements, it is generally not possible to mark and hide loads by means of selection. In the Show navigator, only all loads of the same type (eg Node loads, bar loads, free polygon loads, ...) for displaying or deactivating. Loads are always object bound. If a part of the structure is hidden, the associated loads are also hidden. A special feature are the free loads. If these are not explicitly assigned to specific areas, they will always be displayed - even if the loaded areas are hidden. It is therefore advisable to assign the free loads only to the corresponding areas. This can be done most quickly via Tables 3.6 - 3.11. 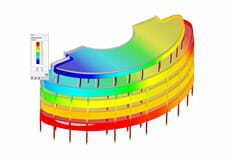 Note: For the model types 2D, the free loads can not be assigned to special areas and are therefore always displayed for the entire structure.